Jennifer Dwyer is our full time receptionist. Jennifer was born and raised in Missoula and attended the University of Montana. She has been in the animal medical field for over ten years. She enjoys all animals, but cats hold a special place in her heart. She has four purebred Bengal cats; Jade, Fancy, Bug and Wiley. Her canine companions are a Shiba Inu named Nakita and a Vizsla/Lab mix named Tundra. When not working, you can find her camping, four wheeling, jet skiing, wakeboarding, or snowmobiling. Her other interests include bowling, reading and socializing with friends, and spending time with her family and pets. Kylah Bragstad was born and raised in Missoula, MT and graduated from Hellgate High school in 2016. She looks forward to becoming a Certified Veterinary Technician within the next few years. Kylah enjoys working with all animals large and small. Throughout high school she was a 4-H member and showed hogs, chickens, rabbits, steers and her dog Miley at the Missoula Country fair. In her time off time she enjoys painting and spending time outdoors with her four dogs: Miley, Toby, Rudy and Bo. She also enjoys caring for her other pets including chickens, ducks, rabbits, goats and her chinchilla Chester. Molly started her career as a veterinary assistant in Ohio, but after completing her undergraduate degree in Biology at Northern Kentucky University, she packed up her dog and horse and moved west to Utah, then Montana. Molly began her work in Montana as a Range Rider for the Blackfoot Challenge, while partnering with Montana Fish, Wildlife and Parks (FWP) on wolf radio-collaring and monitoring efforts in the region. In the off seasons, she completed her Master of Science degree in wildlife biology at Utah State University, where she used her field experience from Montana and her interest in wolf-livestock conflicts to develop her thesis. Upon completion of her Master's degree, she worked for 2 seasons as a wolf technician for FWP, where she continued her wolf trapping and radio-collaring efforts. Though Molly enjoys her wolf work, she feels great joy working with all animals. It was the loss of her faithful dog Luke that inspired her to return to veterinary medicine. Her family includes her husband Tyler, their shepard-husky mix Koda, and 2 quarter horses Expresso and Doc. In her off time, you will find her in the woods with her critters- riding the trails, tracking wildlife, and listening to her husband's hunting stories. 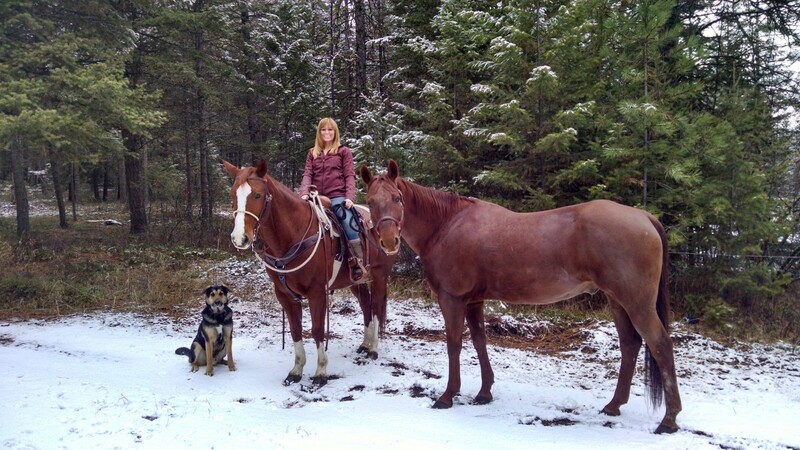 Heidi split her childhood between Texas and Vermont, but the allure of Montana's ranches and mountains brought her west in 2009. She has worked on horse ranches since the age of thirteen, but her desire to work with animals of all sizes has led her to pursue a career as a veterinary technician. She is working towards an A.A.S. in veterinary technology online. Her animal companions include a shepherd mix (Riley), a tortoiseshell cat (Keerah), two rabbits (Buster and Charlie) and a quarter horse (Shiloh). In her spare time she enjoys riding her horse, hiking and backpacking with her dog, weightlifting, gardening, dancing and curling up with her cat for movie nights.